The component of local SEO that causes the most confusion across the board is marketing for multiple locations. When you, as an HVAC company, have multiple legitimate locations, there are challenges that come along with properly optimizing a website to reach all of your target customers. 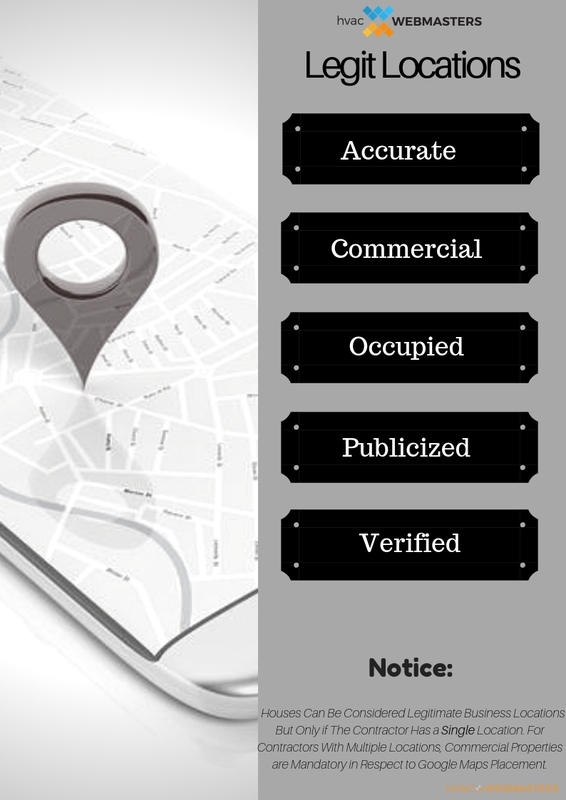 But before we detail how to best optimize them, we should first define a legitimate business location. Google only recently started cracking down on these kinds of locations, but there logic is sound, whether we agree with it or not. It certainly makes optimizing for multiple locations much more difficult, but it also makes the user’s experience far superior. Google wants the best results for their users, and someone looking for furnace repair within a 5 mile radius is unlikely to be satisfied with someone’s mother in law’s closet as the office headquarters. The reality is that the contractor is probably 25+ miles away and will have to drive out to the area, when a contractor who really is located in that radius, loses a customer that is more convenient for all parties. Using these subdomains exclusively was once considered best practice, but fast forward to 2019, and there’s an even better way to optimize. We will still create these subdomains, but we’ll redirect them to a subfolder on your main site. This way, your website’s secondary location would read something like abchvacompany.com/dallas rather than dallas.abchvaccompany.com. Research shows that Google favors subfolders over subdomains, but the incentive to transition expands even further. Think about your truck wrap, which often reads your URL on the side. You wouldn’t be able to fit all those different subdomains on a single truck. With our method, you don’t have to. Instead, you put your main domain, and when users navigate to it, they can find the subfolders and ultimately find the location they are looking for. The benefits of doing it this way are extensive. For one, you create the ultimate reach across all of your geographic locations. Perhaps most importantly, you limit confusion for the consumer and encourage them to use your services as needed. This method is especially straightforward and user-friendly, and that’s why Google loves it so much. In fact, Google themselves utilized this method for their Maps website. The Google Maps URL address used to be maps.google.com which is a subdomain like we talked about previously, but that URL now redirects to google.com/maps which is a subfolder like we’re talking about now. If Google does it, it makes perfect sense why everyone trying to rank on the platform would follow suit. Many HVAC contractors say screw it and go for paid search only. There’s a reason for this. Paid search makes it much easier to target a location, zip code, or region, regardless of how well or poorly the website is optimized. If you are an HVAC website, all you have to do is pick your target location, and pay only for clicks in that area. While we can do PPC management, Facebook Advertising, and Facebook Pixel Tracking without any problem, we strongly advise against this becoming your only source of traffic The ideal solution is to combine both organic and paid methods to maximize returns. You can’t ignore organic. Keep in mind also that paying for regional clicks can produce negative ROI if the corresponding landing page doesn’t mention the city in which your ad campaign is targeting. Google Ads is not the only platform on which to target locations. The same can be done on Facebook, Instagram, and other platforms. At HVAC Webmasters, we generally recommend Google Ads and Facebook Ads for our client. We are Google AdWords Certified, so we can handle your heating & cooling campaign, budget, and maximize the clicks you want in a certain location. While PPC is certainly an avenue to pursue, we must again stress that it should not replace organic under any circumstances. HVAC Webmasters can help talk you through the process and everything involved with it. Call (800) 353-3409 to learn more about marketing for multiple HVAC businesses locations.